A conclusion of an ultra successful trilogy is always hard to top its predeceasing episodes and as a result, directors Mak and Lau go the route not taken, rather than opting for the easy way out. The result is an overly complex movie which required a second viewing in order to fully comprehend. 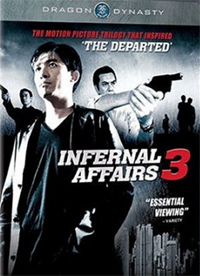 Neo once claimed that he liked Infernal Affairs 3, but is it the weakest of the series, that so many people have come to claim? Personally, I believe that the first one is always the best, then the sequel exceeded all expectations of the quality of any sequel and the third is the most complex one that leaves the audience thinking and scratching. The question ultimately lies in – does thinking and scratching translate into a good movie. The answer is simple, Infernal Affairs 3 certainly rates highly along with the rest of the series and it further explains the notion of continuing to live a life in fear and the consequences of that fear. The movie goes like this: Ten months after the death of undercover cop Chan Wing Yan (Tony Leung), his triad counterpart Lau Kin Ming (Andy Lau) still works in the police force, hoping to right past wrongs by being a good police officer. Lau suspects that something is wrong the minute newcomer Yeung (Leon Lai) steps into the police department. Believing that Yeung is a mole, he tries to nail him no matter how high the costs, even if it means risking the discovery of his own identity! In what is Andy Lau’s most complex role to date and quite rightly deserving of the Golden House Award Best Actor, Lau showed a range that is not often seen and by all means carried the movie through his fear and converging of human mind? Lau handles a difficult role in a menacing and believable manner as he discerns into moments of potential multiple personalities. The typical smile that we always see within Lau’s face is seemingly dawning to endure. A wonderful, well rounded performance that displayed the consequences of one’s action and the danger into the obsession of fear. Likewise, Leon Lai performed extremely well and handled his stoic role in a full on mysterious manner. His character remains very much a mystery, but Lai handled it with flair and certainly a worthy performance to embrace. Tony Leung is clearly someone that does not require doing much, but his presence alone enhanced the credibility of the film. He is irresistible to watch as usual and is pretty much playing the same role as in the first film, but with a more romantic flair within. Leung mixes chemicals with the insanely beautifully Kelly Chen and while, Chen doesn’t do much either than just cry, smile, stare or just look pretty, her role adds an extra layer to the film and the moments of seeing Lau and Leung, sitting in a juxtaposing manner mirroring each other inner’s tortured souls is totally menacing to watch.